Billed as combining tastes, Sour Patch Kids Sweeten Valentine’s Day offers a built in contrast … “Sour then Sweeet.” So the ultimate experience ends on a positive note and taste bud. Merchandising seems on the surface to be simple cardboard carton, but look close to see the mated acrylic tray hidden within. 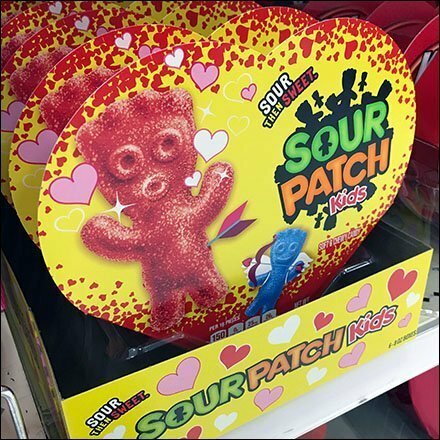 The tray insures the heart-shaped packaging stands erect and stays visible, This Sour Patch Kids Sweeten Valentine’s Day proposition seen at Target.